How do I accurately credit nitrogen from manure? Photo courtesy of Rick Koelsch. 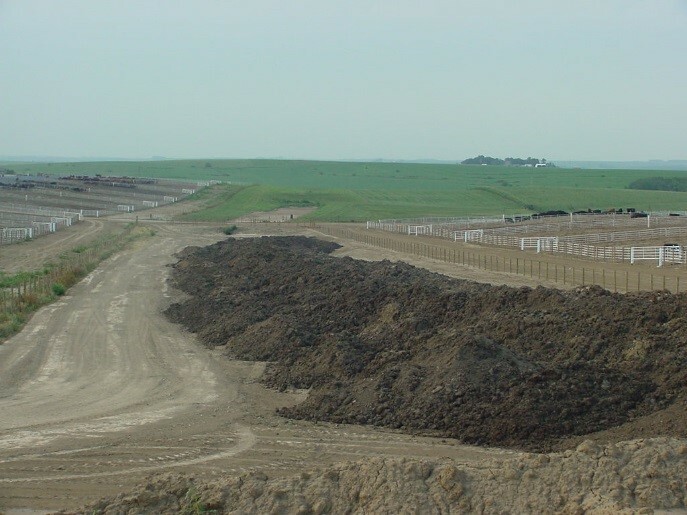 Manure is a valuable source of nutrients offering agronomic and soil health value. Most manure nutrients (e.g. phosphorus) can be managed successfully with traditional soil analysis. However, nitrogen in manure requires some simple advance planning to insure that it is given proper credit for offsetting commercial fertilizer inputs. Manure nitrogen comes in two forms, ammonium-N (or NH4+-N) originating from urine and organic-N originating from the feces. Soil samples typically only measure nitrate-N (NO3--N) although ammonium-N can be requested. Ammonium-N from manure will convert to nitrate-N in the spring as soils warm. Organic-N from manure is a slow release nitrogen that converts to crop available-N through the warmer summer months of the growing season. A late fall soil sample will completely miss any manure nitrogen and a spring soil test may only partially credit manure’s ammonium-N and not credit any of the organic-N.
Take Home Message: Don’t rely on your soil sampling program to credit nitrogen applied as manure. Crediting manure’s nitrogen replacement value requires identification of an availability factor for both ammonium- N and organic-N. These factors can be found in Figure 2. Ammonium-N availability (left hand box in Figure 2) is dependent upon the method of application and how quickly that ammonium-N is moved into soil. For example, if solid beef feedlot manure is applied and incorporated within one day, Figure 2 would suggest that 50% of the ammonium-N be credited (see blue ovals). Figure 2. Suggested crop availability factors for manure-N.
Organic-N availability (right hand box in Figure 2) is dependent upon on the source of the manure. For our solid beef manure example, we would estimate that 25% of the organic-N is available to this year’s crop and 15% is available to next year’s crop (see green ovals). To illustrate the simple calculations for estimating crop available nitrogen, assume that 25 tons of solid beef manure is applied per acre and a manure analysis reports that there is 16 lbs. of organic-N and 4 lbs. of ammonium-N in the manure. If the beef manure is incorporated within 24 hours, how much crop available N is available? Assume that no manure has been applied to this field in prior years. In our example, this manure application rate offers an offset of 150 lbs N/acre of commercial fertilizer. Nebguide G1335 includes a worksheet for guiding these calculations. Take Home Message: The best method for crediting manure nitrogen is a quick calculation for your individual farm’s manure sample, manure source, and soil incorporation practices. If manure application is used to accurately offset fertilizer, research has demonstrated lower nitrogen losses to surface and ground water. Manure is the original slow release nitrogen with the organic-N fraction becoming available closer to the N requirements of a corn crop. Some research has demonstrated that peak yields are observed for manure application at rate replacing roughly 75% of the crop N requirements with supplemental commercial fertilizer used for the balance. This is especially important for manure’s with minimal ammonium-N (such as open lot beef manure or broiler barn litter) or manure’s that are surface applied. Since organic nitrogen is a slow release nitrogen, a fertility program that supplements manure organic-N with inorganic fertilizer (possibly a starter fertilizer) can assist with early season crop vigor. Manures with significant ammonium-N content (and injected) may have less need for supplemental fertilizer for the early season vigor. As a general rule, manure application timing should follow the same best practices as commercial nitrogen fertilizer with application recommended after soils drop below 50 degrees F. High organic-N manures are a little more forgiving. But a late summer application of manure N on wheat stubble may lose some of the organic-N by next spring’s corn crop. Take Home Message: Manure is an environmentally friendly source of nitrogen if used to offset commercial fertilizer nitrogen.